Dressing up for a holiday theme CAN be done tastefully – you can rock red, white and blue and celebrate Independence Day while still looking chic and keeping cool. 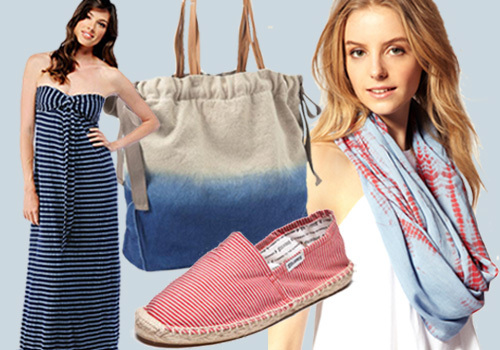 This Fourth of July, try some of these pieces to look festive and totally on-trend. Avoiding sunburns may be the No. 1 concern when hanging poolside or cooking up a barbecue with friends, but when it comes to your ensemble this weekend, the hotter, the better. REVOLVEclothing.com makes a great asymmetric red dress ($445) that wraps, drapes, and flatters without clinging where it isn’t wanted. Pair with gold jewelry and wedges to take the adaptable look from afternoon to after-hours. For a more casual, though no less versatile, take on the color, this Sparkle & Fade Paperbag Short ($48) from Urban Outfitters can be worn in an assortment of ways: We like tightening the belt for a skirt-like, waist-flattering effect, or tucking in a tank and leaving loose around the hips for a boyishly a-line look. Try J Brand’s bright red 811 Mid-Rise Skinny Leg ($176) for a similarly clean line with more coverage. Don’t forget the (leather) cherry on top: Topshop’s Red Leather Sporty Shopper Bag ($98) comes with a cross-body strap that ups its already sky-high style points for increased functionality. They may both be summer staples, but with its cinched waist and delicately crocheted v-neck, there’s nothing vanilla about Topshop’s little white dress ($30). It might get chilly waiting for the sun to go down and the fireworks to come out, so we recommend pairing beneath this Maritime-s+tripe blazer ($94.40) from J. Crew to keep looking, without feeling, cool. Of course, firecrackers + works aren’t all that glitter: The gold sparkle of the logo charm and grommets of the MICHAEL Michael Kors Bag ($198) against the tote’s white leather will help you stand out with a visual pop (not an easy thing on the Fourth! ), while Nicky Hilton’s “Bryant Park” Sterling Silver White Jade Ring ($120) gives the spectacle of sparklers a run for its money with its own blinged-out, eye-catching shine. Between all of the lights and festivities of the day, less color just may be more, and more to your benefit: Try J Brand’s Cadet shorts ($154) and Topshop’s Parasol Toe Loop Sandals ($145) to highlight your tan legs and feet with subtle style. 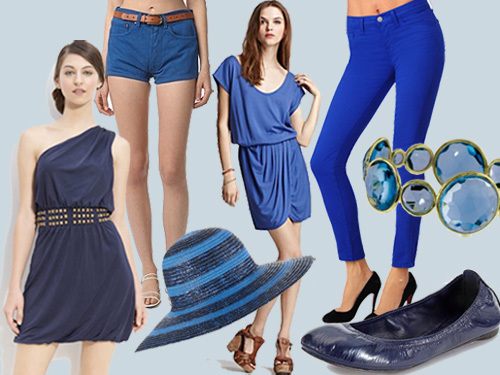 We may be celebrating our freedom from a monarchy, but if you’re choosing blue as your go-to color, we say, go royal: J Brand’s skinny jeans ($176), Ippolita’s blue topaz bangle ($8,500), and ­– fittingly! – Topshop’s blue-stripe hat ($50) all take decadent advantage of the regal shade. Too rich? Try dipping your toes in navy patent-leather Tory Burch flats ($178), or wrapping yourself in this Grecian-inspired one-shouldered jersey dress ($225) by Shelli Segal. For an even looser and casual effect, this scoopneck draped dress ($138) from Bloomingdale’s has all the comfort of pj’s with none of the frump, while Urban Renewal Levi’s Denim Short Short ($39) rests at the opposite end of the fit spectrum by keeping your hips structured and snug. Get the most out of your day and its color palette by mixing and matching – and what could be better than doing so with summer’s hottest trend, a maxi ($121)? The white stripes of the dress’ print are on fire this season, and we’re obsessed with Soludos’ pop-of-red addition to the trend with its Roso ($28) red-and-white-striped cotton shoe. Keep your accessories as fun as the days’ celebrations with the ultimate in festive-wear: tie-dye. ASOS Tie Dye Snood ($20.69) is a chic addition to any out outfit, themed or otherwise, and light enough to act as an accent without overheating you. No matter where the holiday takes you, don’t let it catch you unprepared: Gap’s Dip-dye ($39.95) tote will hold everything you need, wherever you go! I simply wenatd to thank you one more time for that amazing web-site you have developed here. It’s full of useful tips for those who are truly interested in this specific subject, primarily this very post. You really are all absolutely sweet along with thoughtful of others and reading the blog posts is an excellent delight with me. And that of a generous surprise! Jeff and I usually have fun making use of your tips in what we should do in a few days. Our checklist is a mile long and tips will definitely be put to beneficial use.